Some can grow in smaller pots and even thrive in them! 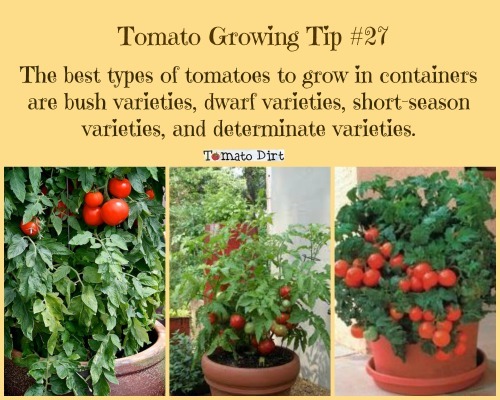 The tomato varieties listed here have a reputation for working well in containers, buckets, tubs, pots, and window boxes 5 gallons or smaller. Height/habit: upright, 18-36.” Can grow to 4 feet high in ground. Baxter’s Early Bush tomatoes mature 7-10 days earlier than most other cherry tomato varieties. They’re known to be prolific producers even if conditions aren’t perfect. Taste is typical sweet/tart tomato flavor. Fruit resists splitting and keeps well after picking. Elfin is a grape tomato with a sweet flavor. Fruit appears in large clusters. Lyana was developed in eastern Europe and introduced to North America in 2004. It can produce well in a 1 gallon pot, but in a larger container it will deliver even better results. Fruit has a strong tomato taste. Micro Tom is an unusually small tomato plant developed at the University of Florida’s breeding program. It works great in baskets, small pots, indoors, or in mixed containers – or if you simply don’t have much room. Micro-Toms can even be grown successfully in 4” pots! 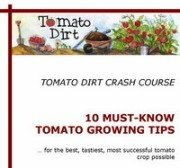 The average 6” plant produces a couple of dozen tomatoes. Great for kids! Height/habit: about 12”. A true miniature! This popular dwarf cherry tomato thrives in small pots, baskets, as part of mixed containers, and even indoors. Red Robin can flourish with less light than other varieties. Fruit is sweet with a “real” tomato taste that’s sometimes missing in cherry tomatoes. Plant Tiny Tim in pots 8” or larger. Staking isn’t needed. Tiny Tim manages cool spring weather better than many tomatoes and is a solid producer for its size. This variety also works well when grown indoors or hydroponically. Abundant fruit and dark green, attractive foliage make Totem a favorite variety in containers, window boxes and for indoor tomato gardeners. Dwarf habit means Totem needs no staking.